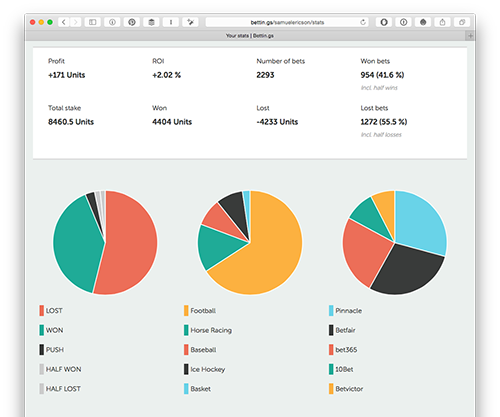 The easiest way to manage your betting portfolio. Once you've made a bet on any of the bookies out there, come here and register your bet. It's superfast, we have information about lots of matches available already. When the bet is settled, update the bets' status. It's done in no time. See how you're doing in, nice-looking graphs. 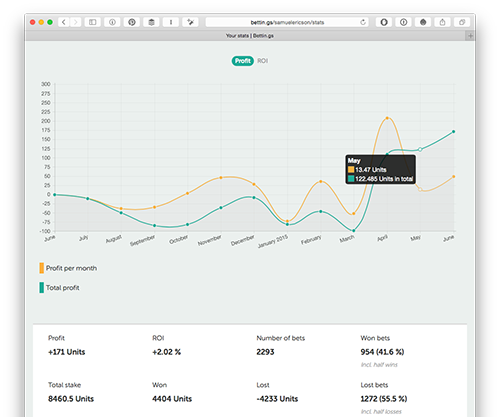 We tell you where you make the most money, how much you make and which bets are most successful for you, plus much more. Who's your top tipster? Top league? What types of bets are your most successful? What sport should you focus on? 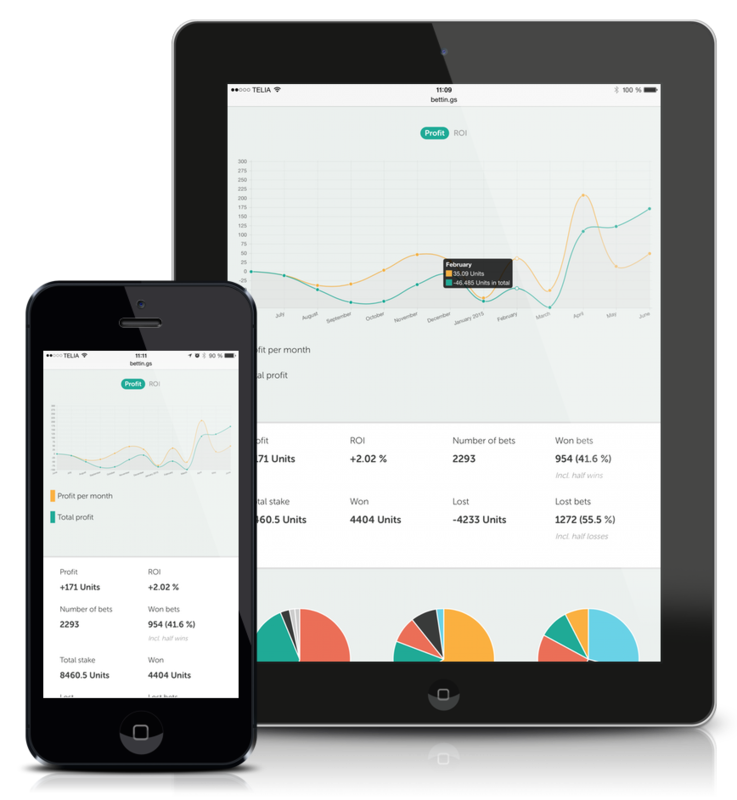 Start tracking your sport bets today and never need to ask again. You select what game you're betting on and we'll enter the date, time, odds and sport automatically. All major sports like football, baseball, horse racing, basketball and ice hockey are supported, all the way down to the lower leagues. 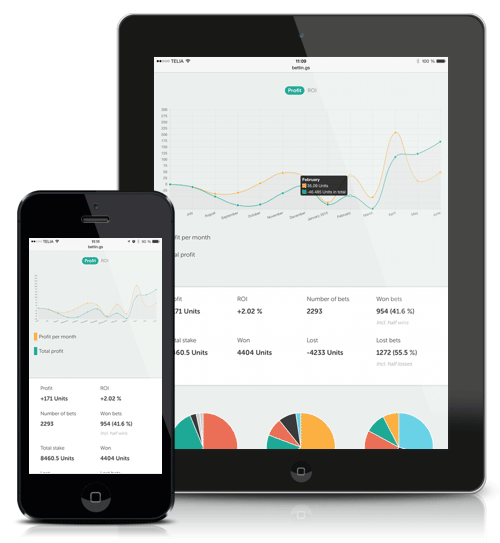 See your stats showing your profit per day, month or year in beautiful graphs. Choose to filter per sport, tipster, date interval, tag or basically whatever you need. Choose to see either the profit for the period our the return on investment (ROI) in easy to understand, good looking graphs. 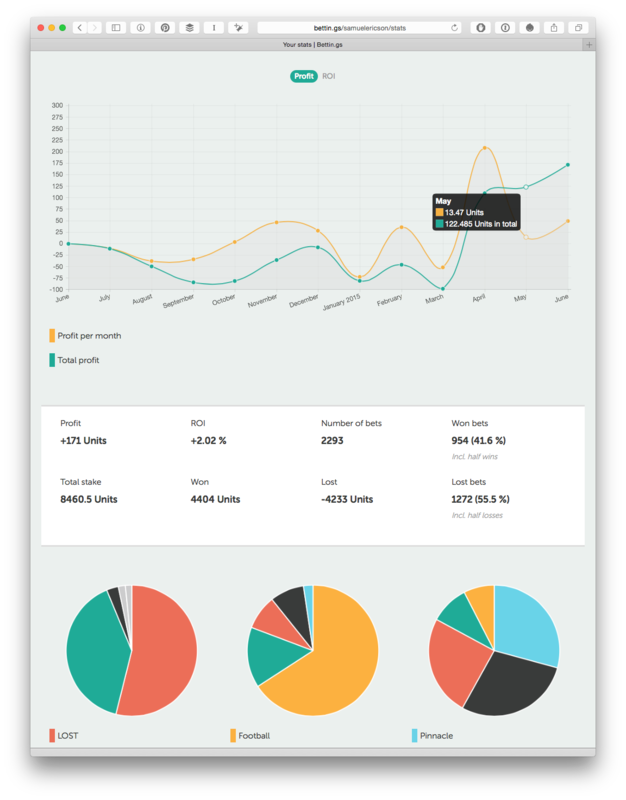 Know where your money is going by analyzing charts showing your most used bookies, sports, tipsters and more. 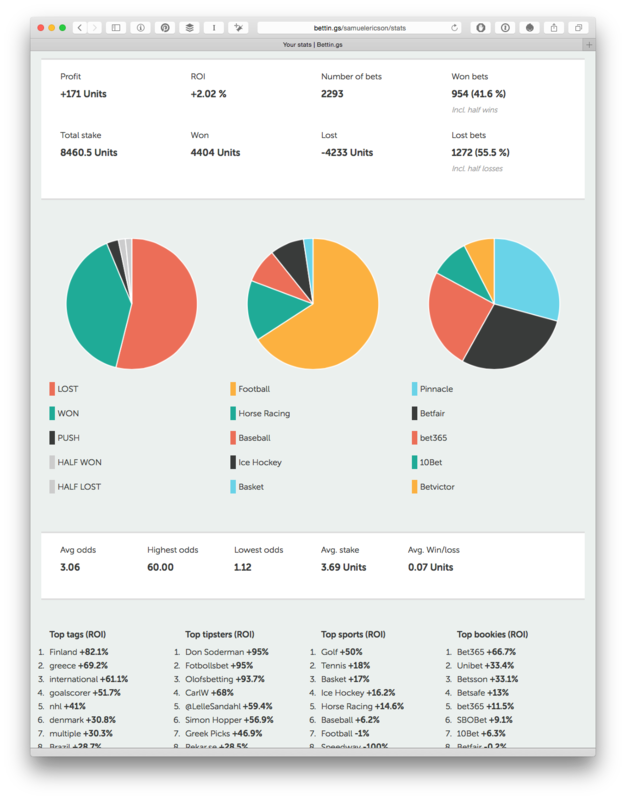 See where you're investing most of your budget and what the basic outcome is at a glance. 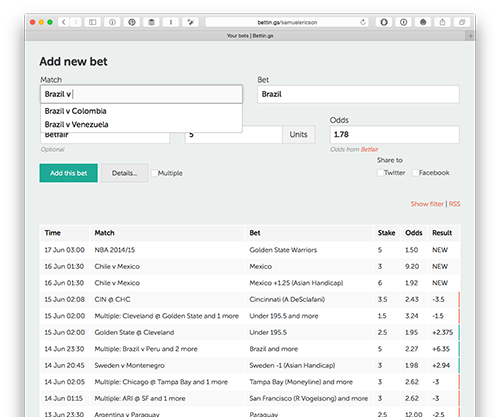 We know that much of the betting happens while on the couch, outside or out on the pub with your friends, so we made it super easy to access your stats and register your bets wherever you are. The website adjusts to the device you're using so you don't even need a desktop computer. Choose to automatically share your bets to Twitter and Facebook as soon as you register them and let your followers know that you're winning. "Great site. Found it yesterday and i really love it! Keep up the good work!" 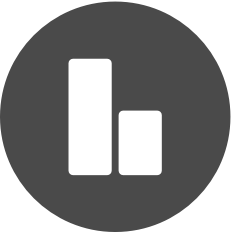 "All tipsters follow @Bettin_gs, best way to keep up your betting portfolio! #bookiebashing"
"We use Bettin.gs to track our bets. 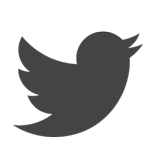 Really useful site that everyone should use!" 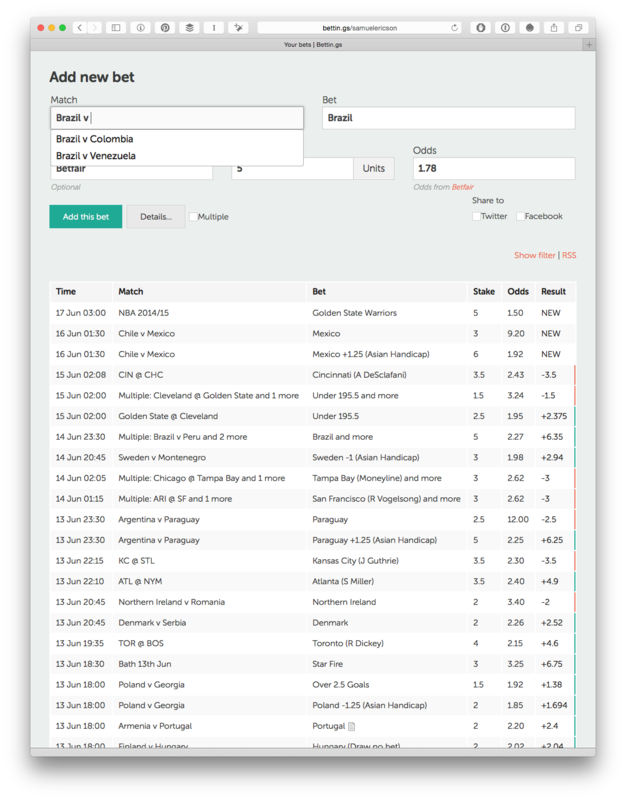 "We've been using @Bettin_gs to track our bets and highly recommend it." "Fantastic. We love your site. Easiest management of the portfolio ever! Keep it up." "Can't recommend Bettin.gs enough to tipsters looking for a review."